Washington County Museum highlights oral histories from community members in its newest exhibit. Touring the Washington County Museum's newest exhibit, ambient notes followed by birds chirping suddenly moves into a busy chainsaw sound. It carries throughout the exhibition hall. This unique soundtrack is part of the museum's newest exhibit, "AgriCulture: Shaping Land and Lives in the Tualatin Valley," which opened this week at the museum's Rock Creek Campus headquarters, 17677 N.W. Springville Road, north of Hillsboro. This multimedia, interactive all-ages installation showcases the oral stories of people who are not only essential to the agricultural success of Washington County, but whose experiences paint a unique history of the area from the 1890s to modern day, said Community Engagement Coordinator Molly Alloy, who served as guest curator for the exhibit. The museum's team listened to its audio archives to find diverse and engaging stories to begin the process, Alloy said. "So many different cultural groups have participated in food and resource cultivation over the history of the Tualatin Valley that we knew we could not create a single narrative for this exhibit that could reflect them all," she said. Through its research, eight individuals who live or have lived in Washington County were chosen to have their stories shared, including farmers, winemakers, laborers and conservationists. Speakers include Peter Hing, Aya Iwasaki Fujii, Jean Edward Muir, Vlasta Becvar Barber, David Lewis, Jose Jaime, Bertony Faustin and Esther Stucki. "My personal angle was to look for where the stories felt like you could step into that person's experience, not choosing multiple stories that speak to the same type of experience and time period," she said. 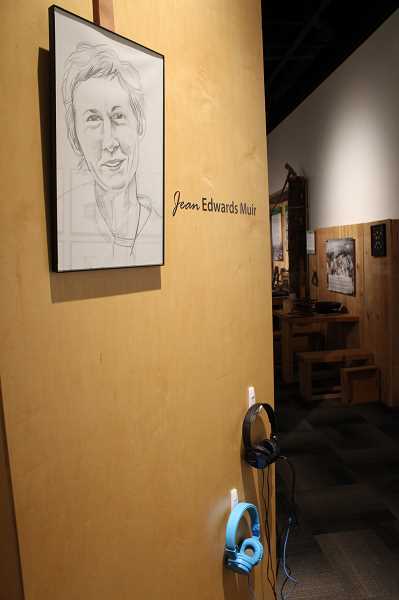 Four stations stand in the center of the room, each with a portrait of the subjects featured, along with sets of headphones for adults and children to listen to their stories to learn more about who they are and what they have contributed to the agriculture side of Washington County. "AgriCulture" not only wants to tap into history, but talk about how "AgriCulture" is a contemporary issue everyone can connect to, Alloy said. "The ways we tend the land, the way we cultivate land, they shape parts of our lives outsides what strictly feels like the realm of agriculture," Alloy said. "It indicates where you live, who you live with, how you spend your time, what you eat, what you have access to." The work of Washington County resident and photographer Leslie Peltz also will be shown. After moving to the area in the 1980s, Peltz began capturing images of silos at different farms in Hillsboro, North Plains, Cornelius and Banks. For kinetic learners, objects like farm tools mentioned in each person's stories will be on hand so visitors can experience what the storytellers experienced, Alloy said. 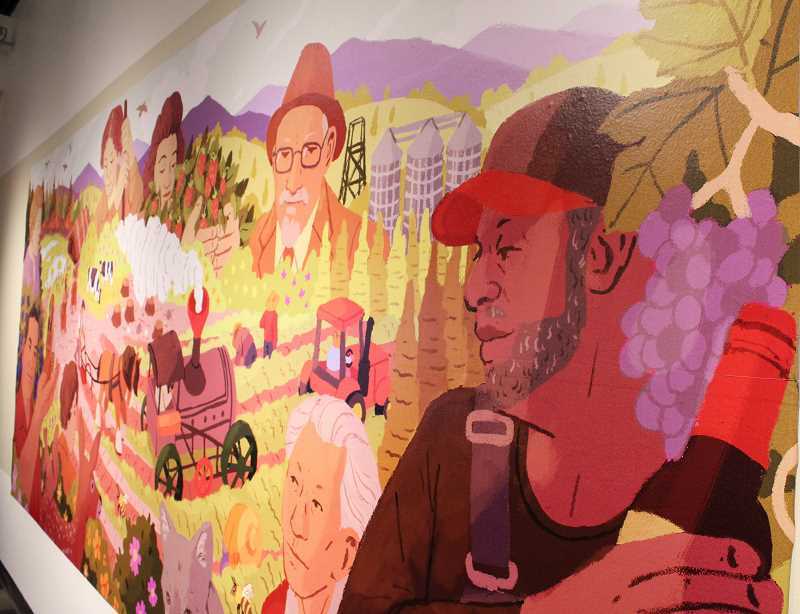 Visually, there is so much to capture visitor's attention, like the bright mural by Portland-based illustrator Anke Gladnick, which stretches over an entire wall, showing eight individuals coming together in a broad landscape, Alloy said. "The beautiful thing about it being visual is that is can piece together the technologies and the factual information about the history of agriculture without it reducing it to one single, certain narrative," Alloy said. "Anyone at any level of experience they have with the field, whatever their family or cultural background is, there is room in the story we are telling for their perspective and their experiences." "AgriCulture" will be on display until spring 2019. The museum is celebrating its first time that an exhibit at Washington Country Museum has been entirely translated into Spanish. It is entirely wheelchair accessible, and written transcripts of the audio are available as well. The museum is open from 10 a.m. to 4 p.m.. Wednesdays, Thursdays and every second Saturday of the month.